In Luchadora by Thunderkick we’re ringside somewhere south of the border. We find ourselves enduring the heat and dodging diving knee drops in search of riches. As you might expect of a slot based around theatrical combat, this one’s full of action. In terms of specifics, the game is played on a five by four board over 30 win lines. If you’re a fan of special features, you’re in luck – Luchadora has loads. There’s loads to cover though so let’s get down to it. Great, action-packed theme. Mexican wrestlers, and red-hot peppers. There’s even a Mariachi soundtrack. What’s not to like? Absolutely loads of bonus features. It might take you a while to get your head around all that’s going on at first but when you do, there’s loads of scope for excitement! Fantastic visuals. The artwork throughoutLuchadora is top-notch. Maybe a little more animation could have been included. The gameplay is absolutely brilliant but perhaps some entrance sequences or some mocked-up matches would be cool? Any “wild” wrestleror La Luchadora= 50x the total bet. The Underdog = 10x the total bet. El Toro = 50x the total bet. El Rayo = 40x the total bet. El Serpiente = 35x the total bet. El Pantera = 30x the total bet. 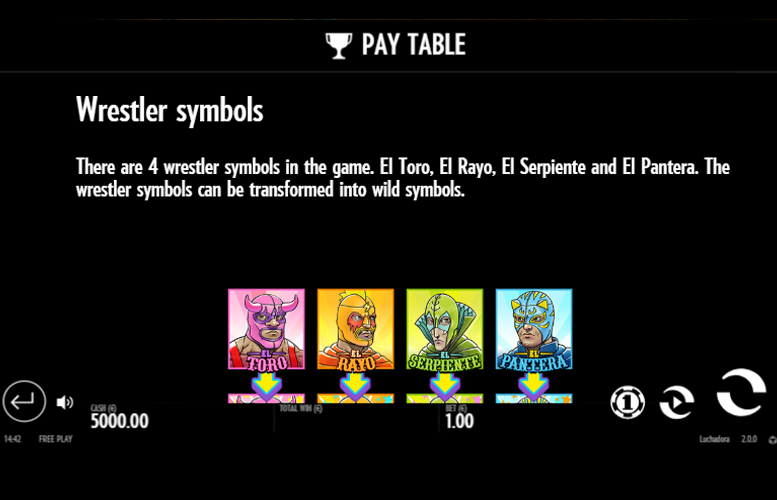 There are four wrestler symbols on the Luchadora slot machine. These are El Toro El Rayo, El Serpiente, and El Pantera. Each wrestler can transform into a “wild” symbol. A nice touch here is that the wrestler’s symbols themselves look angrier or “wilder” than their regular counterparts. 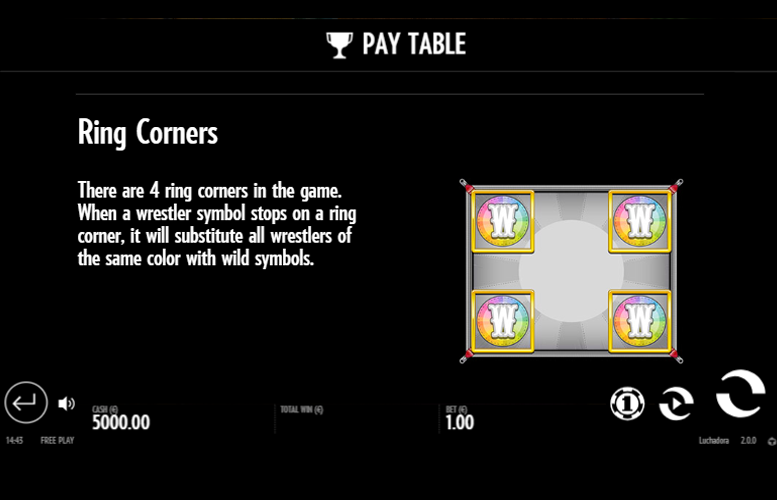 There are four ring corners in the game. When a wrestler symbol stops on a ring corner, it will substitute all wrestlers of the same colour with “wild” symbols. Free spins – players can receive 7, 11, or 15 free spins. Bet multiply win – players can receive bet multipliers of 2x, 3x, 5x, or 15x. Free spins – players can receive 2, 3, 5, or 7 free spins. Wrestler transformation – all wrestlers turn into their “wild” counterparts. 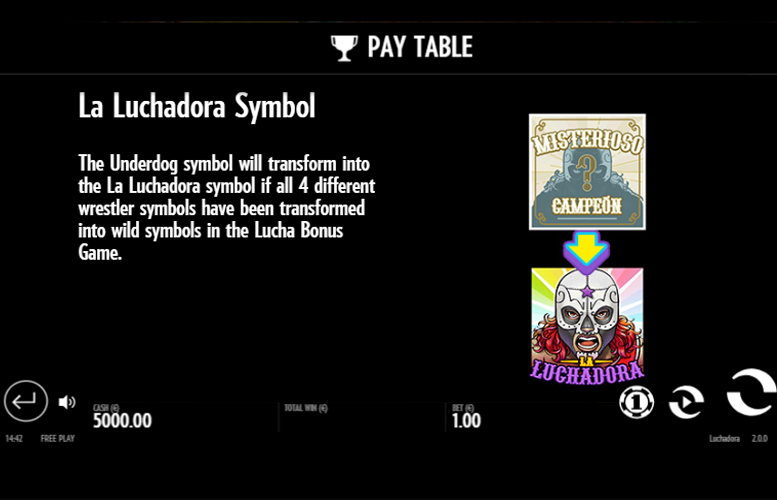 Three “Lucha Bonus” symbols = seven free spins. Four “Lucha Bonus” symbols = 11 free spins. 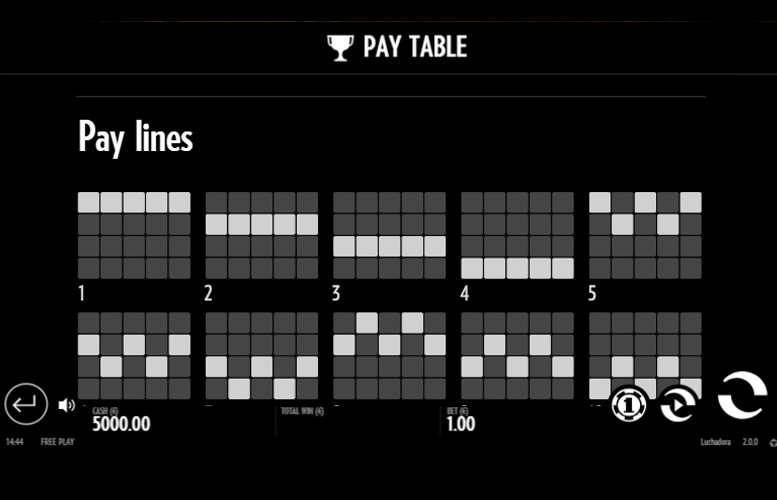 Five “Lucha Bonus” symbols = 15 free spins. 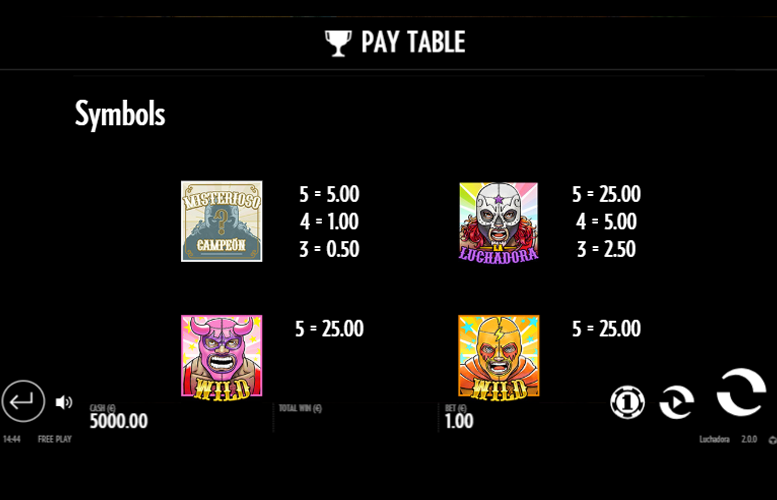 During the Lucha Bonus Game, when a wrestler symbol transforms into a “wild” symbol, it will remain stuck to the reels until the main game resumes. When all wrestlers have been transformed into “wild” symbols, the “Underdog” symbol will be replaced by the “La Luchadora” symbol. Red chilli pepper = 7x the total bet. Orange chilli pepper = 6x the total bet. Yellow chilli pepper = 5x the total bet. Green chilli pepper = 4x the total bet. On Luchadora, it’s only possible to choose the total amount you wish to bet per spin. There are no options to vary either the number of win lines or the amount bet on each. Players are presented with 12 values ranging from just 10p to wallet-straining £100. Such limits will more than satisfy all but those flaunting the largest stacks. We absolutely love Luchadora. It has it all. Great visuals, a fantastic soundtrack, abundant bonus features, and all the excitement of a real underground Mexican wrestling match. Although a little baffling at first, the bonus games on Luchadora are great and really keep the action fresh even on multiple visits. They can also be seriously lucrative with massive 15x multipliers! The only minor drawback of an otherwise exceptional slot is the lack of animation. We can’t help but feel that if Playtech or another massive name had made the game, there would be a full cinematic entrance to really set the scene. 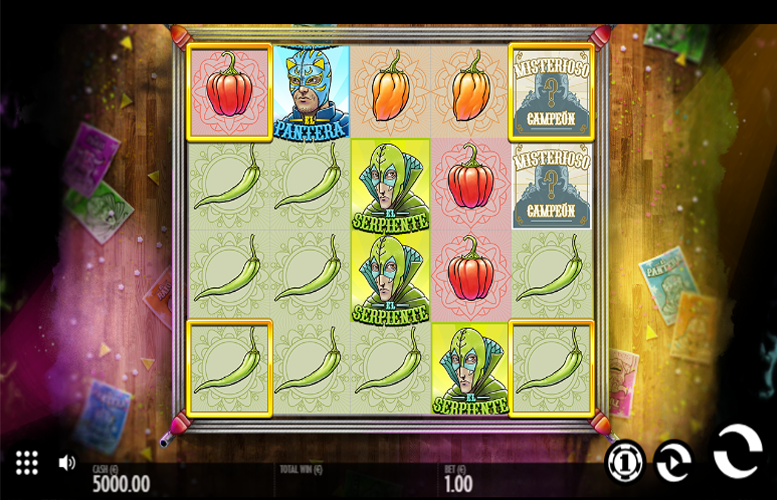 Of course, this doesn’t detract from the gameplay of Luchadora – which is exceptional. This game has a rating of 5 / 5 with 870 total reviews by the users.